Wave soldering is a bulk soldering process used in the manufacture of printed circuit boards. It is used for both through-hole printed circuit assemblies, and surface mount. 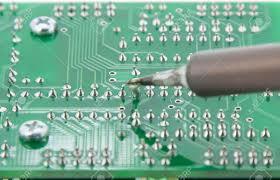 However, wave soldering problems is common during a PCB fabrication process. This can be caused by a variety of reasons and the primary one which comes to our mind in the first time is bad plated through-hole barrels. So check the plating in the barrels to make sure there are no voids is very crucial in a wave soldering process. Voids will have a tendency to create outgassing and this creates voids in the solder joints. The other issue is to bake the boards to expel moisture trapped in a PCB. Great experience in successfully eliminating voids by pre-baking boards and storing them in vacuum sealed bags is really useful. You should know that once a board is baked, if left out in the open air, it will reabsorb 75% of the moisture you just baked out of it within 48 hours. So before wave soldering, make sure the moisture of your board could be as lowest as possible, or you can find voids appeared.